• The printed colored thunderstix noisemakers are the perfect mix of affordability and quality to assure that you have the loudest noisemaker for any sporting event. Often used for promotional purposes at any company or organization occasion or noise makers for football games. • Available in a variety of colors. Personalize your personalized thundersticks to match your favorite sport team's colors or imprint the team spirit noisemaker with your business logo and message. 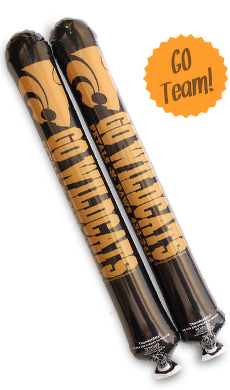 • Designed for 24" x 4.25" printed colored tube thunderstix and made with durable, high-quality material. Size: 24 in. x 4.25 in. Great customer service and super fast turnaround helping us to ensure our promotions are on time! Thank you! We will order from you guys again! THE BEST! From responding to my email at 11pm, following with order confirmation the next morning and delivering in 4 business days.Thanks guys. Oh, and I received 7 extra sets. GO CHIEFS!!!!! The web site was extremely easy to use. The service hads been astronomical. I have not received the product yet to know the quality. I placed an order for 150 sets of thunder stix and needed them pretty quickly. Tyler was great and I approved the proof on a Friday morning and had the product in hand in time for our meeting Wednesday afternoon. They were a hit with the sales team and were great for our sports themed meeting! Would order from them again! A wonderful company and fantastic service! I needed my thunderstix quickly and was under a time deadline. They were fantastic in working with my schedule and We're very easy to communicate with at all hours. My thunderstix were delivered on time and looked great. Will definitely recommend to friends! Everything came quickly and looked as expected! Just placed my second order of Thunderstix to sell in our football concession stand. I was surprised at how big and durable they were and how long they stay inflated. They can even be reinflated! I was anticipating these would be a one-time use item, but someone can potentially use these for the entire season. The company was great in working with me on a design that best fit the "sporty" theme an delivery was quick. We're looking forward to selling these items during our football season! Great product with a great turn around. I am very happy! Great and speedy service. Worked with knowledgeable and friendly staff. Fast Shipping. Will order for basketball season next year! Just got the product in...They look great! We had some trouble with the order, and all problems were resolved very quickly. We would definitely order this product and from this company again. We ordered the thundersticks with very little turn around time but buythunderstix was able to deliever! Great art work - great quality and best of all it was rushed and here when they said it would be. Very easy to work with! Would order again and again from them. Excellent service and great product! They send you an invoice immediately and send you proof of the art work too. Have ordered again and will continue to use this site! Highly recommend. The customer service was excellent. The online help was great and then being able to talk to the worker was very helpful. The product turned out better than we expected! Thanks for the thunderstix - I wish I would have doubled the order - everyone loved them!!! PS - WE WON THE GAME - SECTION CHAMPIONS!!! !